The 9.2 ka Event in Asian Summer Monsoon Area: the Strongest Millennial Scale Collapse of the Monsoon During the Holocene ? A large number of climate reconstructions reveal a climatic pattern far from stable throughout the Holocene, with a series of Decalogue-to-centennial scale abrupt climate events, which are recorded by the δ18O records from Greenland ice cores, the North Atlantic drift ice records, the tropical-subtropical monsoonal records and so on. The most prominent feature of these dramatic climate events is the rapid onset and end within a few decades. The investigating in characteristic and mechanism of these rapid climate events could help us understanding the unstablity of the global climate system and evaluate the risk of abrupt climate changes in the future warming word. Among these Holocene millennial-scale climate oscillations, the 8.2 ka climate anomaly event has received much more attention and has been rather well studied. It is suggested that fresh water input in the North Atlantic, probably initiated by flooding from an ice-dammed lake, could reduce the North Atlantic thermohaline circulation, then resulting in rapid decrease in temperature around the North Atlantic. 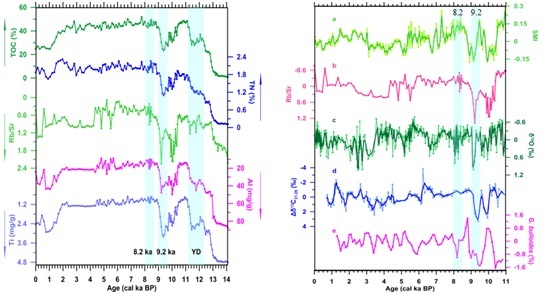 The δ18O records from Greenland ice core show that the temperature rapidly dropped ~6℃ or more at around 8.2 ka BP, which became the strongest abrupt climate event in the Greenland ice cores during the Holocene (Fig. 1). However, recent study by Prof. YAN Hong and his team from Institute of Earth Environment, Chinese Academy of Sciences, suggested that the 9.2 ka event is stronger than the 8.2 ka event in Asian summer monsoon (ASM) area, which is quite different from the Greenland ice record. The scientists used the geochemical, isotopic and pollen records in the Dajiuhu peat to discuss the changes of the ASM at around 8.2 and 9.2 ka BP. The results showed that the peat development was interrupted abruptly at around 9.2 cal ka BP, when the chemical weathering strength decreased and the tree-pollen declined, indicating an abrupt decrease in East Asian summer monsoon at around 9.2 cal ka BP (Fig. 2, Left). 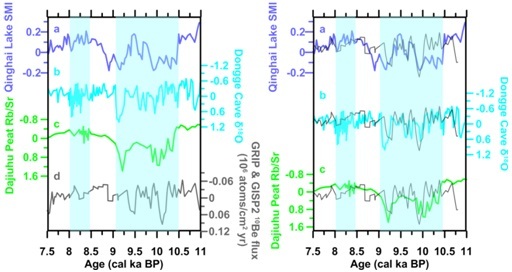 The synthesis of Chinese stalagmite monsoon records and lake sediments monsoon records from Qinghai, Gonghai and Huguangyan Maar Lakes, as well as the marine and stalagmite records from Indian monsoon area, suggested that the abrupt decrease of monsoon precipitation at around 9.2 ka BP is stronger than that at around 8.2 cal ka BP and may be the strongest negative Holocene anomaly in the ASM area (Fig. 2, Right). The scientists suggested that the mechanism of the weakening monsoon around 9.2 ka may be different from the 8.2 ka event. The 8.2 ka event was probably initiated by the fresh water input in the North Atlantic and could deeply contribute to the regional climate changes around North Atlantic, such as the Greenland ice cores. However, the signal of the 8.2 ka event would be reduced due to the long distance transportion from North Atlantic to the ASM area. In contrast, the 9.2 ka event was likely caused by the changes of the solar activity. The variations of solar irradiance could influence the monsoon variability in low latitudes directly through changing the thermo-contrast between tropical ocean and continent. It is noted that the solar output decrease around 9.2 cal ka BP is stronger than that around 8.2 cal ka BP (Fig. 3). Thus the low-latitude hydrological process driven by solar activity probably played a more important role in the 9.2 ka event. This work was published recently in an international journal “Climate Dynamics” . This study was funded by the National Natural Science Foundation of China and the research Projects from Chinese Academy of Sciences.